At some point in their school career, Asperger's (AS) and High-Functioning Autistic (HFA) children are significantly challenged by anxiety. School phobia (known to professionals as school refusal), a complex and extreme form of anxiety about going to school (but not of the school itself as the name suggests), can have many causes and can include related anxiety disorders (e.g., agoraphobia and selective mutism). AS and HFA children with anxieties about going to school may suffer a panic attack if forced which then makes them fear having another panic attack and there is an increasing spiral of worry with which parents often do not know how to deal. Other children with AS and HFA may have felt unwell on the school bus or in school and associate these places with further illness and symptoms of panic, and so want to avoid them in order to avoid panicky symptoms and panic attacks fearing, for example, vomiting, fainting or having diarrhea. 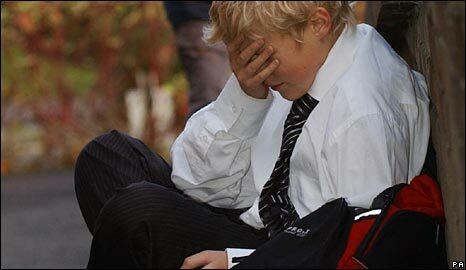 Other kids may have experienced stressful events. Children with an autism spectrum disorder need to be dealt with differently as compared to kids without the disorder (e.g., teaching them relaxation techniques can actually make them more anxious). The longer school phobia goes on, the harder it is to treat, so referrals to Child and Adolescent Mental Health Services are usually quite quick to ‘nip it in the bud’. However, if your youngster is severely affected, it is better to ask for a referral (from your youngster’s doctor or head teacher) to the service before you are desperate as it is often overstretched: in reality it can take some time to get an appointment. Things you can do yourself as a parent include getting help from your youngster’s school. Teachers need to be aware there is a problem. Sometimes being taught in a special unit in school (if the school has one) may help your youngster feel more secure as it is a more comfortable place and acts as a half-way point between home and school. Some AS and HFA children are so severely affected that they stop going to school. It should be made quite clear to your youngster’s teachers that she is not ‘playing up’ but that her anxiety is very real and she is suffering from it. Encourage your youngster to find things she can enjoy in the school day. Explain that her fears are brought on by thoughts that are not true thoughts; she is reacting to normal things in an extreme way. Find things that your youngster can look forward to each day. Keep to the same routine. Make her go to bed and get up at the same time every day (even on weekends) so that she has some secure framework to live around. Reassure your youngster. Tell her that she will be fine once she has got over the part she dreads. Tell her she is brave for going to school. Although her friends find it easy, she has a private battle she has to fight every school day. Tell her you are proud of her for being so brave. • Anonymous said... Homeschool was the best thing I did for my daughter. • Anonymous said... Homeschool!!! Made a world of difference for our son. There is no need to force children into painful, emotionally damaging situations every day. • Anonymous said... I am homeschooling my son this year after a horrendous attempt at mainstreaming at a new school last year that just left him feeling horrible about himself and behind academically. • Anonymous said... My son was compressing his anxiety all day and then melting down the second he was off the bus. It would happen every single night. Several times a week the school would call be because he was vomiting. After we finally figured out what was going on, we made the decision to homeschool him. It has been the best decision we've made and a huge blessing for our family. He is doing great, light years ahead academically and happy. I wish we'd have started when he was younger and never put him through that at all. 99% of the time, his Aspergers symptoms are gone or under control now. • Anonymous said... My sons kindergarten teacher told me he should snap out of it. She immediately learned the extent of my vocabulary. • Anonymous said... Same for my son....I homeschooled my son (12) last year. This year he is going to attend a small private school that is very similar to homeschooling with multi age classrooms. • Anonymous said... School is a constant struggle for my 16 year old aspie son. He's currently in a special ed autistic class at his high school but he still struggles with not wanting to be there. Last year we dealt with him having thoughts of injuring/killing one of his teachers. He too would hold things in until finally blowing up. I have been told by his IEP team and school counselors that home school would be a horrible idea for him and that because he has an IEP the school would not approve it. I considered online schooling for him but was basically told no. How did you all get around that? We live in Washington state. • Anonymous said... they likely say that because they don't want the school to lose funding they get for kids on IEPs, and plus the school has no right to tell you how you educate your child. Since when do schools have to approve homeschooling? Sounds like bullying tactics to me. It is your choice. • Anonymous said... This was perfect timing for me..school starts on Tuesday and last year was a constant battle with the school and getting the kids to go. Meltdowns, nightmares, and physical illnesses all year. I have been strongly considering homeschool iand its great to know how well it has worked for others. • Anonymous said... We had the experience. We cyber school now and it has changed everything for the better. So grateful for options such as this to help these precious children succeed.